Yogyakarta, Monday 08 April 2019 The Masters Program in Science and Doctorate (MD) FEB UGM again held an open examination. This time a student named Firma Sulistiyowati, S.E., M.Sc., Ak., CA., QIA. 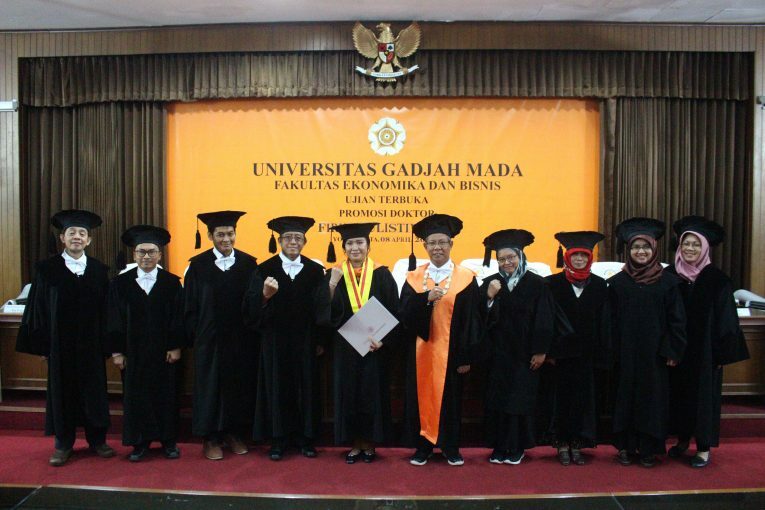 officially holds the 4351th doctorate at Gadjah Mada University, and the 265th at the Faculty of Economics and Business, with the predicate of Very Satisfying. Previously, Dr. Firma Sulistiyowati, S.E., M.Sc., Ak., CA., QIA. is a FEB-UGM Doctoral Accounting study program student and works as an accounting lecturer at the Faculty of Economics, Sanata Dharma University. The doctoral promotion open examination was led by the chairman of the hearing Eko Suwardi, M.Sc., Ph.D. (Dean of FEB UGM), and a team of promoters Hardo Basuki, M.Soc.Sc., Ph.D., and co-promoter Ertambang Nahartyo, M.Sc., Ph.D., CMA., And Suyanto, MBA, Ph .D., And the Examination team consisted of Sony Warsono, MAFIS. Ph.D., Choirunnisa Arifa, M.Sc., Ph.D., Dr. Sri Wahyuni, MSi., Ratna Nurhayati, M.Com., Ph.D., and Zuni Barokah M.Com., Ph.D.
Dissertation by Dr. Firma Sulistiyowati, S.E., M.Sc., Ak., CA., QIA. with the title ‘Procedural Justice and Internal Whistle Blowing: Testing the Role of Authentic Leadership as Moderating’. The research method used by Dr. Firma Sulistiyowati, S.E., M.Sc., Ak., CA., QIA. is an experimental approach 2×2 between subjects. The subjects of this study were 67 professionals who worked in various fields who were pursuing S2 studies. The results of testing the first hypothesis found that employees would tend to do internal whistle blowing in high procedural justice conditions rather than low procedural justice conditions. The results of testing the second hypothesis found that employees who were faced with high procedural justice conditions and low procedural justice conditions in situations where authentic leadership had a greater tendency to do internal whistle blowing than employees who were in a situation of low procedural justice and no authentic leadership.